Some days, life's just not fair! From the moment he wakes, Arthur Pillock is having the morning from Hell. As disaster piles upon disaster, Arthur's increasing misfortune only enhances the life of a mysterious tramp. Why? And when life can surely get no worse, Arthur finds himself centre stage in 'The Squeaky Clean Comedy Challenge.' 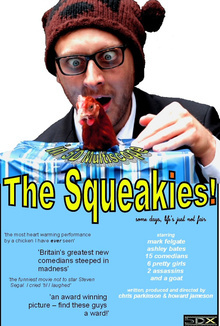 'The Squeakies' is the world's first movie to be filmed in '5D Multiscope' employing unique 'ocular enhancers' for maximum community enjoyment. It is also the only film ever to feature 15 comedians, 6 gorgeous girls, 2 overweight assassins, a performing goat and a chicken.